Some of the most beautiful things in video games, as my colleague Patricia Hernandez noted on Friday, are the mistakes, the glitches. Some of the best surprises, however, are the ones game developers intentionally hid for us somewhere in the forests of the games we play. These delights are planted along the path to please the explorers of interactive adventures like the so-called "Trail Magic" rations left along the Appalachian Trail by kind-hearted strangers for weary hikers. I'm thinking a lot about the surprises hidden along the paths of the games I play, because I'm playing New Super Mario Bros. 2 these days, the latest in gaming's premiere series in surprise-packed game design. Each step across Mario's new world is an opportunity to be tickled by some new discovery. A green pipe here is a passageway to a secret room; a green pipe there tilts to the side and rockets Mario into a secret stratosphere. The Mario games have always been full of great surprises. See that bad guy floating around on a cloud? Jump on his head, if you can get that high, and notice that even though he falls off the screen, his cloud stays there. Jump on it. Suddenly, you've got a cloud you can control, a sort of magic carpet. What's the red dot on the map mean? Oh, there's a second exit to that level there. Do you know what you just did? You've just done something that turns all the game's flying bullets into birds and its turtle enemies into baseball players. The new Mario, made by a generation of younger game designers at Nintendo, some of whom attended a Mario "cram school" feels as rich with minor surprises as the old ones. Its paths are full of trail magic. As I play it, I'm reminded, though, of the best surprise I ever experienced in a Mario game and maybe the best surprise I've ever found in any video game. 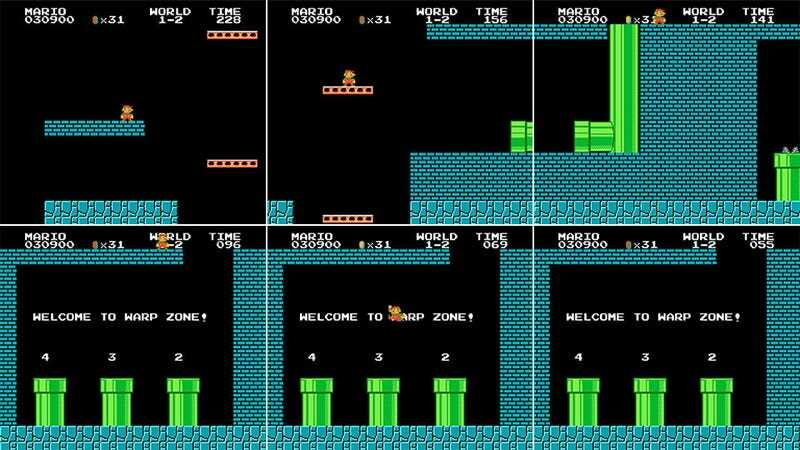 It's in Super Mario Bros. in World 1-2, the game's first underground level. Any veteran player knows it. You can breach the ceiling, breaking beyond the apparent boundaries of the game's playing field and run in front of the scoreboard, then fall into a hidden room, jump into one of three warp pipes and skip the next portion of the game. As famous as Super Mario Bros. 's warp pipe surprise is, I've long been puzzled why it wasn't copied by many other game designers. We'd had the breaching of walls to find hidden rooms before, most notably in Atari's Adventure. But as popular as Mario was, the ability to break beyond the game's boundaries and play outside of the box never became a popular thing. (It returned sporadically and most magnificently in Valve's Portal). That's too bad, because the message of Mario's 1-2 surprise has always been, I thought, the most astute message ever communicated between video game creator and game player. It is the message of the game developer acknowledging that, yes, dear gamer, the essence of what you do is to poke at the boundaries of the system we've given you, to bend the rules when you can and to find the shortest routes. The message of Mario's World 1-2 surprise has always been, I thought, the most astute message ever communicated between video game creator and game player. The ability to breach the ceiling in World 1-2 was the Nintendo design's teams way of nodding at this, of acknowledging the player's zeal to exploit any trick possible to get ahead. It was a playful encouragement to damn near cheat at the game, to break the rules. Go ahead and break the borders, they said. Go run on the ceiling and skip the next part. That, to me, is the essence of playing a game and therefore the best surprise ever packed into a Mario adventure.